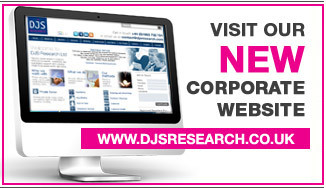 DJS Research is an independent UK based consultancy specialising in market research surveying. It has extensive experience of implementing and managing quantitative and qualitative market research projects within various UK industry and international sectors. The consultancy offers a range of services from identifying market research requirements, devising a suitable programme, through to project implementation and reporting findings. We are consultancy based in the North West of England and pride ourselves on offering affordable but quality UK based market research survey services. We also work on complex international market research projects. We guarantee that all of our market research projects receive the close personal attention of a Senior Market Research Executive and are undertaken according to the strict rules and standards of the Market Research Society. Identifying your individual market research requirements and devising a suitable programme. We will be able to advise you on the best solution for your needs, whether it be quantitative market research, qualitative market research or a combination of both. After ascertaining your market research needs, DJS Research will be able to help with project design, implementation, management and analysis. This may include services such as desk research, questionnaire or topic guide design, depth interviews, group discussions or telephone interviews. In addition, from time to time you may require extra resource for your market research surveys project - we would be happy to offer our services to work within your market research team. We are flexible in the way that we work, for your market research, you might require a full service approach or you may require a resource for a particular aspect of your market research project - whichever we will be happy to tailor our service accordingly. To get in touch, either call +44 (0)1663-732721 or send us your market research requirements/questions through our online contact form - click here. We look forward to hearing about your market research survey project.